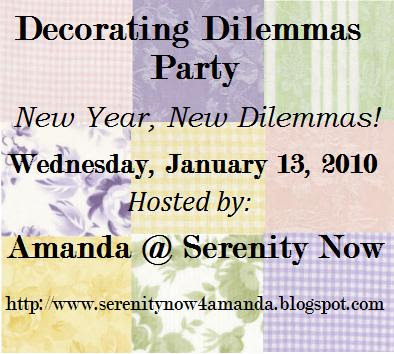 Just a reminder that the Decorating Dilemmas Party will go up TONIGHT (Tuesday) at 10 pm Eastern Time. Take a minute and look around you. Surely you have something you've been avoiding making a change to, simply because you couldn't decide what to do with it. 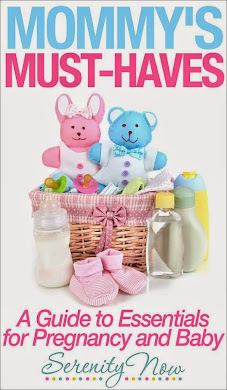 Let some bloggy friends help you out! 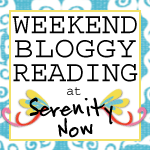 Take a photo or two, tell us about your Dilemma, and then link up here at Serenity Now. The party will be up all day Wednesday as well. Don't have a Dilemma? Then maybe you have a SOLUTION...have you turned Blah into Beautimous lately? Please share with those of us who could use a few tips! Please feel free to email me if you have any questions. Any home related Dilemmas and Solutions are game: kitchen, garage, basement, kids' rooms, closets, empty walls, old picture frames, patios, you name it! You can see the first Decorating Dilemmas Party here, and another one is here. I hope to see you here tonight or tomorrow, mingling with the other partygoers and getting some great feedback and inspiration! Oh wow... oh wow oh wow! I DO have a decorating dilemma... I have lived in my house for 3.5 years, and the walls of our master bedroom are still stark white. The room is just an utter design connundrum. I will have to go take some pictures and link up, cuz I could definitely use some help! I have my post ready. Good thing I did it early cause I am so sick today - can't even prop my head up on two pillows without puking! I am really excited that I have a party to go to where it doesn't matter if I am sick! Hi Amanda- I have a decorating dilemma but don't have a blog. Can I play? Can't wait! I'm going to post pics of my master bedroom where absolutely NOTHING has been done! Thanks for hosting. This is such a great party idea! Hey, Amanda, I want to help Stacey with her turquoise bathroom, but for some reason I can't get a comment box to pop up. I was going to tell her to embrace the aqua fixtures until she is able to change them...it's a popular color right now! Paint white or replace the oak towel bars, etc. Bigger mirror, or lower the one she has and paint the frame white. White beadboard wallpaper or panelling part way (maybe 2/3) up the wall with a strip of molding capping it off that is wide enough to function as a little ledge to set some decorative accessories on...shells, framed photos, etc. Can you pass this on to her...thanks! Oops, should have left that comment on the other post, but I guess you'll get it anyway! My dilema is a brick wall and fireplace in a house we are buying, its very ugly and I need some inspiration/advice as to what to do with it!